There is a great need for understanding soil science principles across a variety of disciplines such as agriculture, forestry, environmental science, ecology, geological science, physical geography, and natural resource management. By conducting experiments, students’ knowledge of content is heightened, yet hands-on field and laboratory experience in post-secondary education is not always possible due to time or budget restraints. 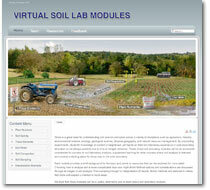 These virtual soil laboratory modules will be an accessible complement to courses on soil laboratory analysis, supplement learning for other courses where soil analysis is relevant, and provide a starting place for those new to the soils laboratory. Each module provides a brief background for the topic and points to resources that can be explored for more detail. Choosing how to analyze soil is more complicated than one might think! Method options and considerations are discussed through all stages of soil analysis, from sampling through to interpretation of results. Some methods are featured in videos that show and explain a method in more detail.